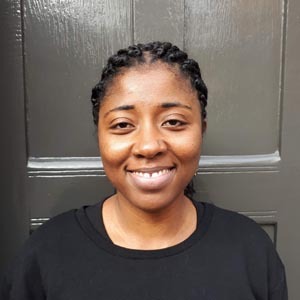 Amanda Bisong, ECDPM blog, 28 January 2019. For (most) African countries, last year ended on a high note with anticipation and excitement on the signing of the Global Compacts on Migration and Refugees. At the continental level, AU states adopted key agreements to promote free movement within the continent. The year also saw improved dialogue between African and European member states on migration issues. Some of the trends have been highlighted in our Challenges Paper, such as the continental agenda for free movement of persons, a positive dialogue between EU-AU partners and the quest for long term pragmatic solutions to migration management. 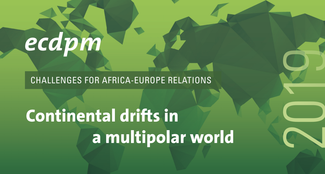 But as national interests compete with continental and external pressures, will the euphoria of the anticipated gains from last year’s achievements continue and will it frame the migration dialogue between African and European states also in 2019? African member states adopted the AU revised Migration Policy Framework for Africa and the Free Movement Protocol in 2018, which still awaits the ratification of 14 more member states. The African Union has chosen to focus on refugees, returnees and internally displaced persons and the search for durable solutions to forced displacement in Africa as its main theme this year. This means that discussions at the continental level on migration and displacement issues will increase and that, hopefully, this will draw more attention to the implementation of the comprehensive refugee response framework (CRRF) in African countries. The single African passport is also billed to be adopted this year. This is the first step towards improving the free movement of persons within the continent but, ultimately, visa restrictions among countries have to be removed for this to occur. Implementing a single passport regime will lead to harmonising information systems between immigration authorities based on the guidelines established at the continental level. This will, in turn, assist in addressing issues such as the control of migrant smuggling, human trafficking and migration-related criminal offences through information available to state authorities. While the regional level plays a key role in promoting migration and enhancing labour mobility, national interests are paramount in implementing regional and continental policies. States are reviewing their national laws and policies relating to migration in line with national interests. Ethiopia, for instance, has recently adopted a visa-free policy for all Africans and reviewed the regulation allowing refugees to work legally. The AU’s (and regional) agenda on migration and its call for free movement within the continent is likely to conflict with the EU’s agenda to contain and restrict movement of Africans to the EU. So far, the EU’s agenda on migration in African states has resulted in increased restrictions to movement. This, in turn, has influenced intra- and inter-regional movements within Africa. A case in point is Niger. Niger has been highlighted as one of the most cooperative states with the EU in reducing the number of arrivals of irregular migrants, the balance between cooperating with EU priorities and regional agenda for free movement in West Africa has led to conflicting interests. These competing priorities and interests will likely be solved with solutions that prioritise national agendas on migration. North African states, for instance, outrightly rejected the EU’s proposal of regional disembarkation platforms – places outside the European borders where migrants could apply for asylum after being rescued in the Mediterranean. However, in spite of the disagreement on regional disembarkation platforms, some states like Tunisia and Morocco are moving forward with EU support on border management measures which are in line with their national priorities. The relationship between the European and African partners seems to be gradually calmer after the tensions that followed the 2015 EU ‘migration crisis’ and the discussions in Valletta. The conclusions of the Senior Officials Meeting on the Valletta Process and those of the recent EU-AU ministerial meeting evidence a more positive dialogue on migration emerging between partners. Border management, returns and readmission will still feature in the discussions as EU member states seek to reduce the number of irregular migrants arriving in Europe. Cooperation at the bilateral level has been more successful in increasing the number of returns. However, this short term emergency approach which focuses mainly on returns is not sustainable. The quest for long-term approaches towards sustainable migration and development outcomes will continue to feature in the discussions. As the year unfolds, one wonders, will this be the year that brings a comprehensive approach towards migration management and a focus on long term pragmatic approach towards AU – EU migration relations? To move towards a long term pragmatic approach, African and European states would need to work together to find solutions that will focus on wins for all parties including the migrants. How this will play out in an era filled with aid conditionalities tied to development and national interests remains to be seen. 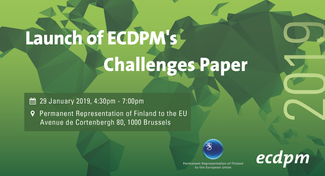 Would you like to read ECDPM’s Challenges Paper 2019? Please click on the image below. Photo courtesy of tom albinson via Flickr.